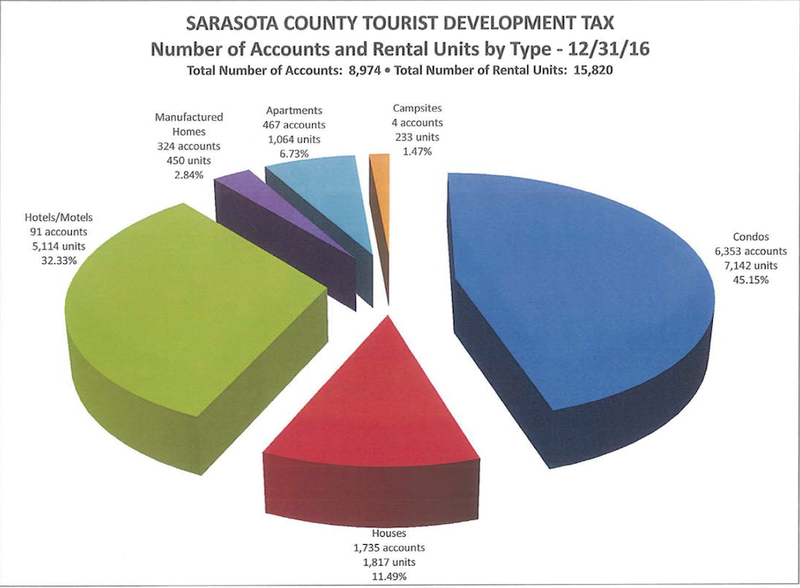 In the 2016 fiscal year, condominium units continued to comprise the largest percentage of entities collecting Sarasota County’s Tourist Development Tax (TDT), Tax Collector Barbara Ford-Coates has told members of the county’s Tourist Development Council (TDC). Condominiums made up 45.15% of the total, though that was a dip from their 45.8% share in the 2015 fiscal year, according to the annual TDT report her office completed for the 2016 fiscal year. Hotel and motel rooms were in second place, with 32.33% — up from 32.21%, the figures showed. 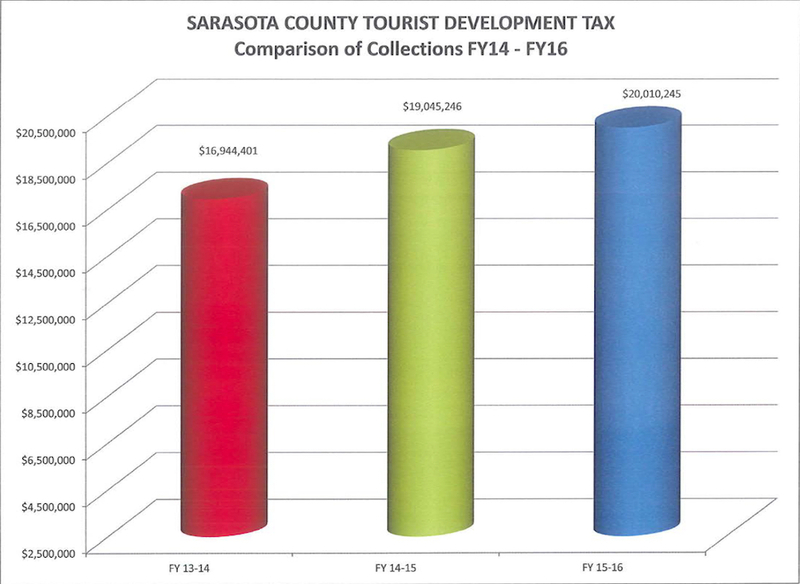 However, “For the first time since 2009, hotels and motels surpassed condos in revenue collection,” she pointed out during the advisory board’s regular meeting on March 23 in Sarasota. All of the figures were based on data her office had gathered through Dec. 31, 2016, she explained. In her presentation, Ford-Coates also noted that while she had thought she would have a contract in place well before now with Airbnb — the internet-based accommodations service — the County Commission is scheduled to address a proposed contract during its regular meeting on April 3. County commissioners last year also talked of their strong desire to have the Airbnb contract in place prior to the arrival of the expected tens of thousands of international and domestic visitors for the rowing event, which will be held Sept. 23 through Oct. 1 at Nathan Benderson Park near University Parkway. Regarding details of the TDT annual report: Revenue brought in by hotels and motels made up 45.13% of the total through Dec. 31, 2016, Ford-Coates told the TDC members, with condos accounting for 43.43% of the $20,010,245 for the fiscal year that began on Oct. 1, 2015 and ended on Sept. 30, 2016. Overall, she noted, TDT revenue for FY16 was up 5.19% over the total for FY15. March again was the busiest month of the past fiscal year — as usual — with $3.37 million, “the most we’ve every collected for a single month,” Ford-Coates told the board. The figure represented a 4.56% increase over the total for March 2015, according to the TDT annual report for FY16. Especially strong increases year-over-year were recorded for December 2015 and July 2016, Ford-Coates said. Three months had collections that surpassed $2 million, she continued, and the other nine months all had revenue figures surpassing $1 million. As of Dec. 31, 2016, the TDT annual report says, 8,974 TDT accounts had been registered with the Tax Collector’s Office, representing 15,820 units. The number of accounts was up 2.63% compared to the FY15 figure, with a 2.69% increase in units. The largest rise among types of accommodation was in the House category, the report notes: That was at 11.49%, up from 10.59% in FY15. Apartments accounted for 6.73%, with manufactured homes at 2.84% — down from 2.97% in FY15 — and campsites at 1.47% — down from 1.51%. Siesta Key entities continued to bring in the highest percentage of TDT collections, Ford-Coates told the TDC members: 32.4% — up from 31.3% in FY15. The City of Sarasota was in second place, with 30.2%, an increase from 27.7% in FY15. “The number of delinquent accounts has remained consistently low,” Ford-Coates noted. Each month, her staff contacts every account that does not file a return, she explained; most delinquency issues are resolved within 30 days. In FY16, Ford-Coates said, 230 new accounts were added to the list, and those collected $116,500. The annual report notes that staff searches not only the Airbnb website, but also those of VRBO, HomeAway, FlipKey and Craigslist. “These websites do not list owner information or address; therefore, tools such as Google Earth, the [county] Property Appraiser’s website, and Sarasota County GIS mapping are used to identify the property address based on advertised photos,” the report says. Additionally, referrals of properties to check “typically come from owners who are already paying the tax but suspect a neighbor is not doing so,” the report adds. The Tax Collector’s Office received 61 such referrals in the 2016 fiscal year, the report notes, compared to 39 in FY15. 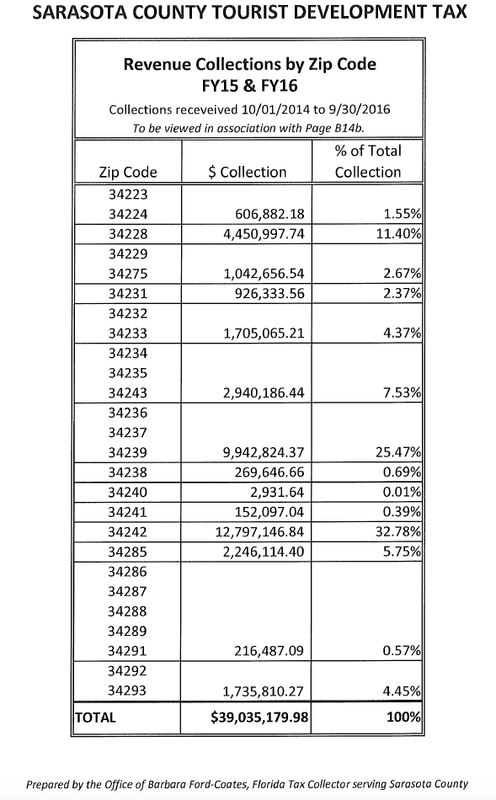 In response to a TDC request last year, Ford-Coates also noted on March 23 that the FY16 report includes a chart showing the total of TDT collections for the past two fiscal years by zip code in the county. Because of the legal necessity to protect the confidentiality of entities that report the revenue, she explained, her staff incorporated two years of data in an effort to prevent any reader from deducing the collections of particular entities. 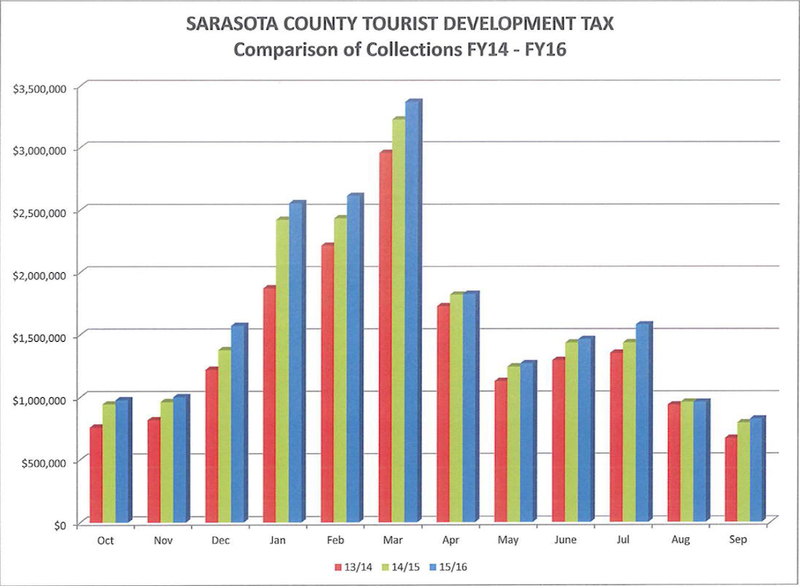 That chart shows that accounts in the 34242 zip code — which includes Siesta Key — brought in the highest amount of collections for the past two fiscal years: $12,797,146.84, or 32.78%, of the total. In second place, the 34239 zip code had revenue of $9,942,824.37, or 25.4%. In the fall of 2016, she added, she finally turned over the matter to the County Commission. Deputy County Attorney Kathleen Schneider has been handling the negotiations, Ford-Coates continued, noting that the Office of the Sarasota County Clerk of Court and County Comptroller and Ford-Coates’ staff have reviewed the tentative contract, and Airbnb representatives seem to feel comfortable with the terms. When TDC member Norman Schimmel asked if she could estimate how much extra annual TDT revenue the Airbnb contract could be expected to bring the county, Ford-Coates said $355,000 “is what we anticipate.” Already, she added, her office has about 140 or 150 accounts that advertise through Airbnb, so her staff will have to work with those to make adjustments if the contract is finalized. Commissioner Charles Hines, who chairs the TDC, said he was curious to see — especially in the first year or two — how much extra TDT revenue the county would collect with the Airbnb agreement in place. “I’m excited about that. I just always thought that was an abuse” for people to rent accommodations through the internet-based service and not pay the county tax, he added.